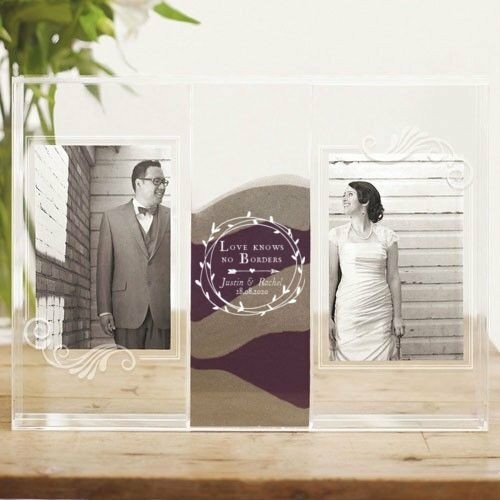 This unique photo and sand ceremony shadow box features not only a separate compartment for the bride and groom to fill with sand, but also two compartments designed to hold standard 4" X 6" ~ 10.2 cm X 15.2 cm photos. Simply place the photos between the two layers of acrylic provided and slide into position. Stylish etching will provide beautiful framing to complete the look. Following the wedding, this will make the perfect keepsake that can be displayed in your home and enjoyed for years to come. Non-personalized versions in store immediately. Price includes personalization etched beautifully on the front of the Sand Compartment. Clear top cover holds sand secure. Compartment holds 2 tubes of sand. Colored sand and pouring vases sold separately. - Please allow at least 1 week for personalisation.